Hooray! Your family is heading for delight! 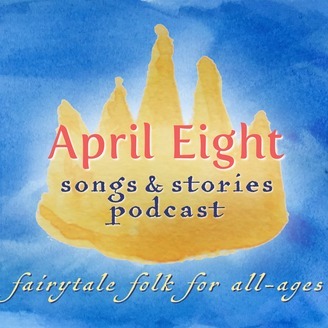 April Eight Songs & Stories is a charming original fairytale podcast series for the whole family. Listen together as a lovely green world of wonder full of humble gnomes, sparkling fairies and grouchy trolls, mischievous woodland creatures and magical butterflies who are more than they appear, take you on adventures where everyday kids, tricky witches, lost crowns and fearless queens encounter magical potions and wondrous journeys. Giggle, laugh out loud, think a little deeper, hold your breath, smile - and get ready for your kids to say, "Play it again!" 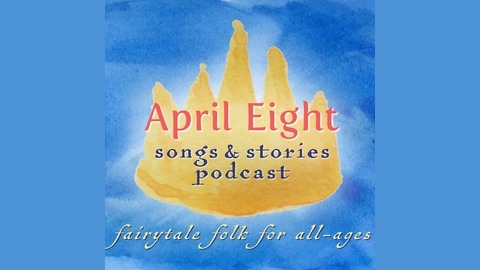 For on the April Eight Songs & Stories Podcast, unexpected heroes take the day in pursuit of life's simple truth: Love conquers all and will always find a way. Start with Episode 1, and let the fun roll on from there. Find out more at aprileight.com. EP 46, "The Lost Fairy Series Story 2: In the Forest du Lutin"
Today's tale is a continuation of our story from Episode 44, “The Lost Fairy Series Story 1, The Tiny Trumpet”. In today's story, the Fairy Prince and his fairy fellows set out on a journey to find a lost friend. They stop for a rest and run into some pixie problems... A sweet, funny fairytale story for your kids at bath time, bedtime, car time, and family time. “Oh no! It’s raining!” said Geraud in a panic, diving under a leaf to keep his wings dry. “What do you mean, I”m not getting wet?” said the Prince. Iris looked up, “That’s not rain, it’s pixies!” she shouted, pointing to the trees above them. “Oh, not pixies!” cried the Fairy Prince! And there, standing on the branches of the tree above the Prince, as naughty as could be, were a dozen little pixies holding buckets of water. And the next thing the fairies knew, they were pouring water all over them. For a wee soggy fairy can’t chase after you! Pixies play tricks! Pixies play pranks! Pixies Pixies Pixies, Hooray Hooray! Tee hee heee heee teee heee hee!" If you'd like to hear the story I'm referring to in this story, listen to episode 36: "The Two Sister and the Wolf". An original Fairytale by April Eight. c2018 All rights reserved. Ep 45 SONG: Halloween Songs! EP 44, "The Lost Fairy Series Story 1: The Tiny Trumpet"
Ep 43 SONG - A Summer Song - "Wild Mountain Thyme"
Ep 42 "Story 4: The Two Sisters and The Wolf"